Party Mix Lollies by Australian companies Cadbury Fresha and Allseps, come in 400g, 1.3kg and also 10kg. This is an assorted mix of great tasting lollies. 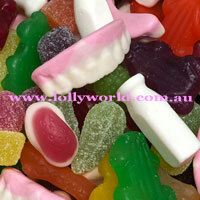 The 10kg Bulk Mixed Lollies is ideal for corporate events. Mixed Lollies are the best way to entertain at parties. No hard decision about what lollies to share. The mix contains a random lolly assortment of Milk Bottles, Spearmint Leaves, Fruity Frogs and Snakes. Strawberries & Creams, Laughs, Jubes and also Mixed Berries. This way everyone gets their favourite lollies in one bag! This mix also comes in a 100g Party Bags for party gift bags or corporate functions.